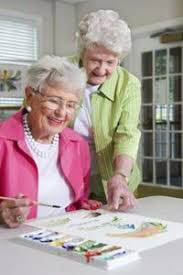 For your art enthusiast residents Susan offers art classes to feed their need. The media is varied and based on the interests of your residents. The frequency is usually twice a month, however more or less scheduling is always possible. Classes are generally one hour in length with a 15 minute setup and cleanup. All materials are supplied as part of the program, including plastic tablecloths to protect the table tops! As an instructor Susan addresses the needs of all skill levels during the classes, from total beginner to talented artist. Everyone can enjoy the fun at their own comfort level as well as rise to the challenge of learning new skills. In addition she also offers one-of workshops that range from one to three hours and can be booked individually. Painting parties are very popular these days and Susan offers her own unique version. Rather than following the instructor along on a prescribed design, Susan prefers that participants actually learn some skills at her parties. So the party begins with some basic colour mixing exercises and knowledge about painting with acrylics. Then a demo of how to get the painting started. She sets up an actual still life for students to work from and then goes around helping each person, in their own style, to develop their painting. Then more demos and more encouragement. At the end of the party every participant has a different version of the same still life and has an original painting to be truly proud of. So basically, you get your friends together and Susan will bring everything you need to your location... oh, except the wine and snacks! The optimum timeframe for a painting party is three hours. Consultation and Private Classes are available at either at your location or Susan's Studio. As the Canadian rep for the Michael Wilcox School of Colour (SOC), Susan is available to do one-hour presentations on colour for art groups and organizations, as well as offering one and two-day colour mixing and colour harmony workshops. In addition, she has a maintained inventory of SOC books, paints, brushes and home study courses at her location in the Village of Cumberland, in Ottawa’s east end. You can order directly from her and save the shipping costs!